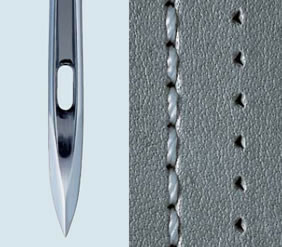 Groz Beckert industrial sewing machine needle - 134-35D Leather point, available in sizes 120/19, 130/21 and 140/22, in 1 x packet of 10 needles or 10 x packets of 10 needles. Cuts the leather with a prominent triangular shape. Straight stitch appearance. The sewn thread is slightly elevated. Stitch holes are relatively large. Medium to short stitches possible. Application field: Suitable for straight sewing. Effective on hard and thick leather as well as cartons. Example: Belts, suitcases, heavy shoes and plastics. Please choose your pack quantity and size above. We cannot possibly list all the makes and models of sewing machines this needle will fit, if you do not have a pack with the details on, please email your sewing machine make and model and the size of needle you require to parts@hobkirk.co.uk and we will advise you of the correct needle system to use. Groz Beckert 134-35LR leather point industrial sewing machine needle - available in sizes 120/19, 130/21 and 140/22, in 1 x packet of 10 needles or 10 x packets of 10 needles.